EEZKEEPER Automatic Hay Feeders feed what you choose, when you choose from 1 to 10 times per day allowing quality care for your animals and flexibility for your busy lifestyle. Developed by lifelong livestock owner-businessman, Larry Green, from the need to get his animals fed and watered properly in a timely manner started the search and development of reliable devices to get it done when he couldn’t be there. With the help of several mechanical, design, and electronics engineers many years have been spent in the field, literally, and in the shop to develop and produce the most reliable, sturdy, versatile, reasonably priced automatic horse/animal feed dispensers and accessories possible in America today. Simplicity in design and function, when engineered, has produced a line of EEZKEEPER.com products that will last for many years of service. How Does An EEZKEEPER feeder work? An EEZKEEPER feeder operates on 8 D-cell flashlight batteries, that will last over a year, and gravity which allows it to avoid power outages, surges, etc, and to stand alone and be placed just about anywhere without existing 120v power. The hinged Lexan shelves are flipped up latching them in the horizontal, usual, shelf like positions. Feed; hay, grain, supplement, etc, is placed on the shelves; feeder is filled. The 7 day electronic timer is set, stays set until it's changed, to feed as many days per week, as many times per day, at whatever times per day you choose. YOU GO ABOUT YOUR LIFE. When the times you've set appear on the timer clock, the next lowest shelf with feed on it will drop; release latch , hinge down, and gravity propels the feed out the 10" x 24" opening at the front bottom animal side; the only side the animal should ever see. Is the EEZKEEPER Only For Horses? No! Goats, Sheep, Alpacas, even your pet cows can enjoy the benefits of the EEZKEEPER. But I Have a “Slow Feeder or Slow Feeder Net”… Isn’t That The Same? Not the same at all! The EEZKEEPER feeder is a controlled, regulated slow feeder which time dispenses for several programmed feedings the type; hay, cubes, pellets, grain, etc, and amount of feed you choose,—not the animal. Safe, healthy and convenient for your animals. Designed, for many years of use, to help animal owners provide a safer, healthier, more convenient alternative to slow feeders that puts you, the owner, in control. What Kind of Feeding Options Are Possible? So There Are "Endless Options" For Programming? Yes, there are ENDLESS OPTIONS. Unlike any other feeders, our versatile 7 day a week timer can easily be programmed to feed as many time(s) per day, at whatever time(s) per day, on as many/whatever days per /week...you choose. Owners commonly feed twice per day with the EZ8 model and refill every four days or feed tree times per day with the EZ9 model and refill every 3 days. All the models can be set for endless options. Some set to feed once per day; morning or night, and hand feed the other feeds. Some with sick animals feed feed all shelves per day and refill daily. Some set to feed earlier on weekends so the animals are well fed and ready to go to shows, outings, etc, when owner is ready. Just too many feeding options to list here, so let your needs select your option. The EEZKEEPER.COM products are a very safe and smart option for care of your animals. Thousands of feedings with the EEZKEEPER feeders without any adverse problems and EEZKEEPER waters have flawlessly functioned in the same trough for over 10 years. Slow feeder barrels, boxes, nets, etc are notorious for tearing up gums, wearing down teeth, and even contributing to colic as many animals over time ingest enough of the plastic, wood and net material to become unhealthy. Add up all the "inexpensive" slow feeder replacements over time + vet bills and EEZKEEPER feeders will prove to be the least expensive and most convenient by far. Honestly, you’ll wonder how you ever got along with out them. But Do I Really Need To Spend $2000 To Ensure/Insure The Health and Well Being Of My Horse? YES! Compared to the cost of trainers, bedding, feed, clothing, saddles, bridles, show halters, trucks, horse trailers, people to feed when you're away, and all kinds of “bling" — to the ONE thing that can help protect their horse’s digestive and mental health, in a way that can save you THOUSANDS on veterinary bills, and lost performance due to colic, ulcers etc, — the EEZKEEPER FEEDERS are very reasonable investment. When you factor in the convenience and reliability, our clients, can’t quit raving about them— and your animals will be thrilled too- showing it through superior health, and performance! Am I Able To Feed My Horses At a Consistent Time Every Day? Yes, the timer stays set until you reset it. You've learned animals are happier with a regular feeding schedule. They wait with anticipation as feeding time rolls around, yet life happens and there are times when you're just not able to be there to feed. Boy, do they let you know when you're late – circling, stomping, whinnying, pawing, snorting, and fighting with their pasture buddy or stable mate. That kind of behavior offers the perfect condition to encourage ulcers and a nice ‘gas colic’ started— with a large vet bill to go along with it! Animals thrive on consistency and love the EEZKEEPER feeders. Can I Sleep In Or Go Out Of Town Without Worrying? YES! This is one of the biggest benefits! Most animal owners take minimal time away from home because of the challenge of getting feeding done correctly. Imagine sleeping in, leaving early or getting home late, going away for a weekend or vacation, having an emergency that keeps you away and having the comfort that your animals get fed. Not to mention on those cold days when getting up early and safely walking to the barn in the sleet and ice make it so miserable. If you leave for an extended time your feed person isn't required to be there to feed around feeding time in morning and night. They stop by as their schedule allows during the day to check and refill when necessary. How many years have we scheduled our lives around our animals' feeding schedule? With an EZKEEPER feeder your horses or animals have their schedule --and you have yours... Freedom! How Can The EEZFEEDER Help My Horse With Metabolic or Insulin Resistance Problems? Resistance, or Ulcer Troubles? Horses are designed to feed throughout the day. Insulin Resistant horses and horses fighting ulcers benefit especially from several small meals to keep insulin levels even and acids at bay. You can take care of your life responsibilities and provide the best feeding schedule for your horse with up to 10 small feedings every day. What horse couldn’t benefit from that? Can EEZKEEPER Feeders Work In Outdoor Conditions? Most definitely as they were designed to live outside near the Sierras in Northern Nevada through -30f in winter through +110f in summer and kept right on reliably feeding. “Made in America”, EEZKEEPER feeders, if described anyway, are overbuilt out of sturdy, reliable materials that are designed to live outside in all kinds of weather. Reliable, Convenient, eating the way nature intended, healthy and calming to the animal's mind—Your animal and you will love your EEZKEEPER feeder. ORDER the EEZKEEPER Today and Enjoy The EEZ Peace Of Mind For Years To Come! Horse owners who keep their horses at home can relate to the need for feeding horses on a regular schedule. Horses with ULCER, COLIC or METABOLIC problems— are desperately in NEED of the EEZKEEPER to help regulate their blood sugar, help with digestion and help to absorb and regulate acids. Many riders compete or go on extended trail ride excursions where horses need to be fed early. 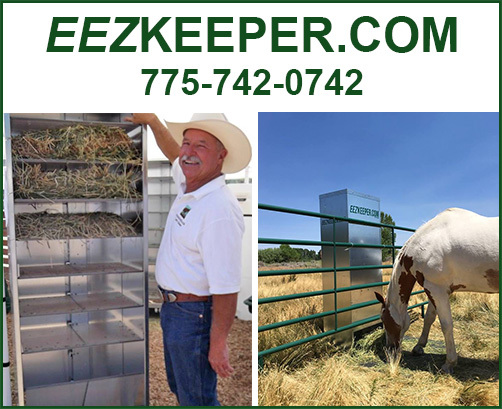 EEZKEEPER Automatic Hay Feeders is the solution that you and your horses will enjoy for years to come. We’re excited to hear from you- just pick up the phone and call today!